Perched on the north bank of the Thames between Southwark Bridge and London Bridge, Cannon Street station sits within an area particularly rich in history. Over the Thames; the approach into Cannon Street station. Some 2,000 years ago, in the days when the city was known as Londinium, the patch now occupied by the station was home to a large Roman building known as the ‘Governor’s Palace’; an imposing administrative block, estimated to have been built circa AD80 to AD100. 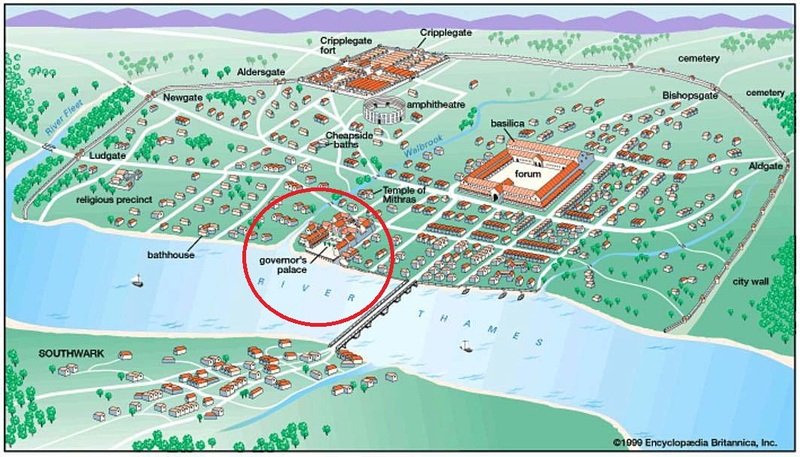 The Roman Governor’s Palace (Image: Encyclopaedia Britannica). This bureaucratic building is believed to have contained suites of offices and was accessible from the Thames via a wooden jetty. Some remains of this Roman site still exist deep beneath the railway terminal. By the medieval era, the road from which the station takes its name had become known as Candlewick Street on account of the numerous candle makers who lived and worked along the thoroughfare. The present name, ‘Cannon’ is in fact a corruption of ‘Candlewick’ and has nothing at all to do with heavy weaponry! 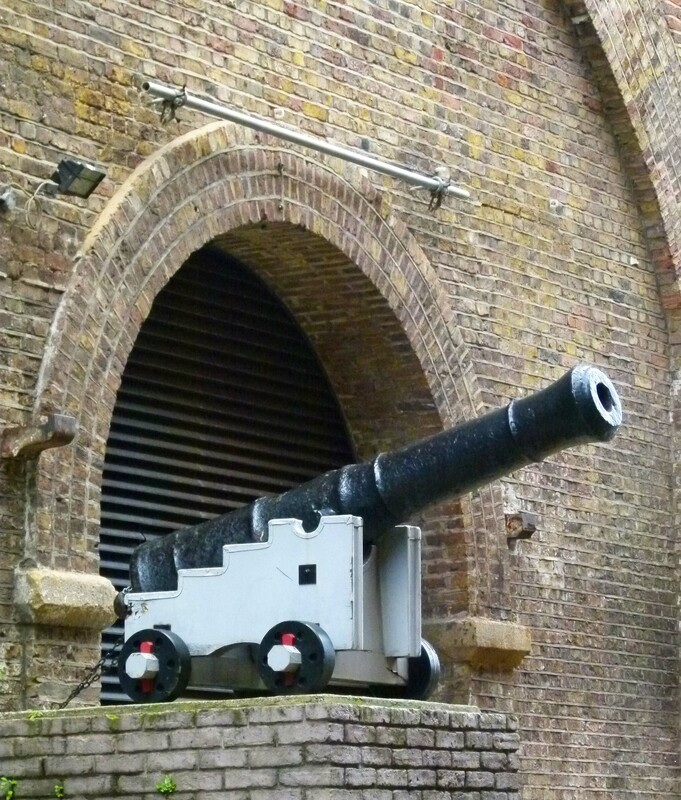 An ornamental cannon outside Cannon’s Health Club which sits beneath the station… should’ve really been a giant candle stick! By the 10th century with the Roman office block long since crumbled, a major commercial base began to develop on the site. Known as The Steelyard (derived from the German word, Stalhof meaning ‘trading base’), this large depot was owned and operated by the Hanseatic League; a powerful confederation of guilds originating in Saxony. 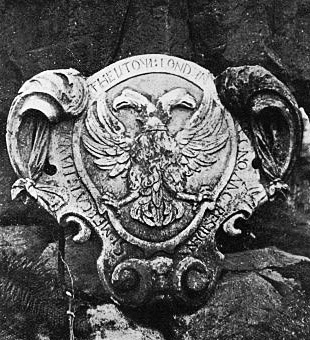 A Hanseatic Coat of Arms from London. 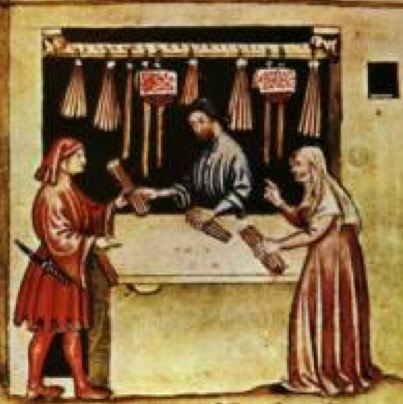 Dominating trade across Northern Europe for several centuries, the Hanseatic League was a precursor to today’s multi-national organisations. Their Cannon Street centre remained in use up until the 16th century. 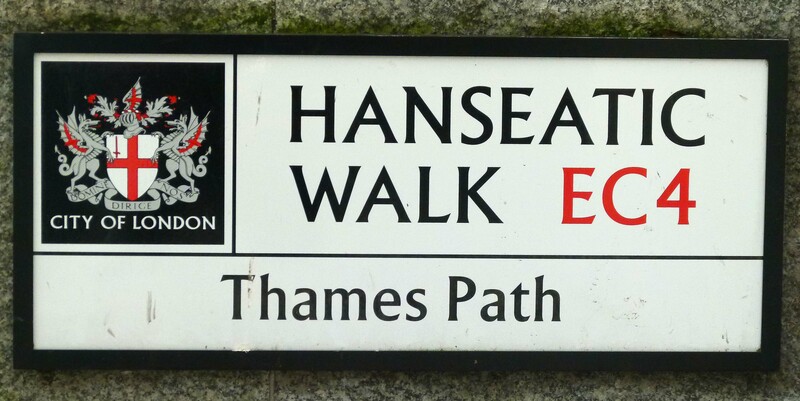 Today, the Steelyard is commemorated in the names of two Thames footpaths; Hanseatic Walk and Steelyard Passage. 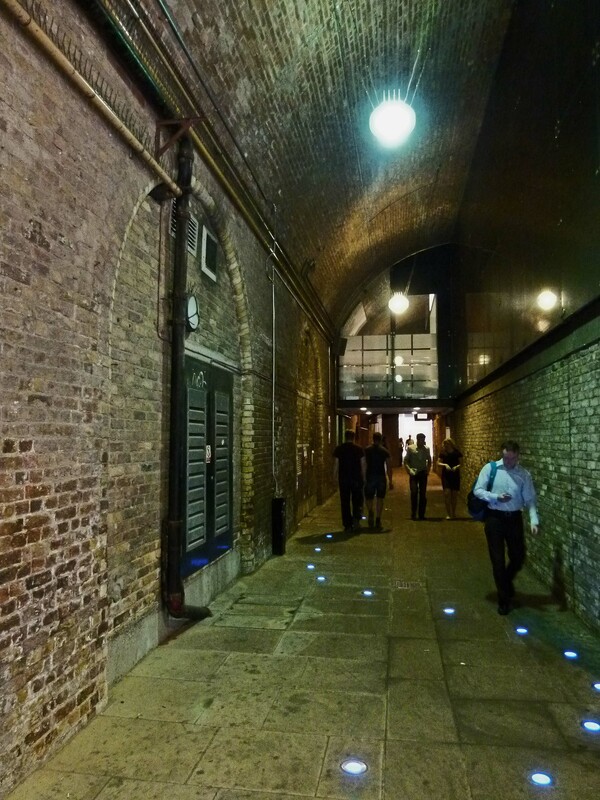 Running in a brick tunnel beneath Cannon Street station itself, Steelyard Passage is equipped with speakers which pipe out industrial sounds; atmospheric recreations of what one’s ears would have rung to in the days when the area served cargo ships rather than trains. Steelyard Passage which runs beneath Cannon Street Station. 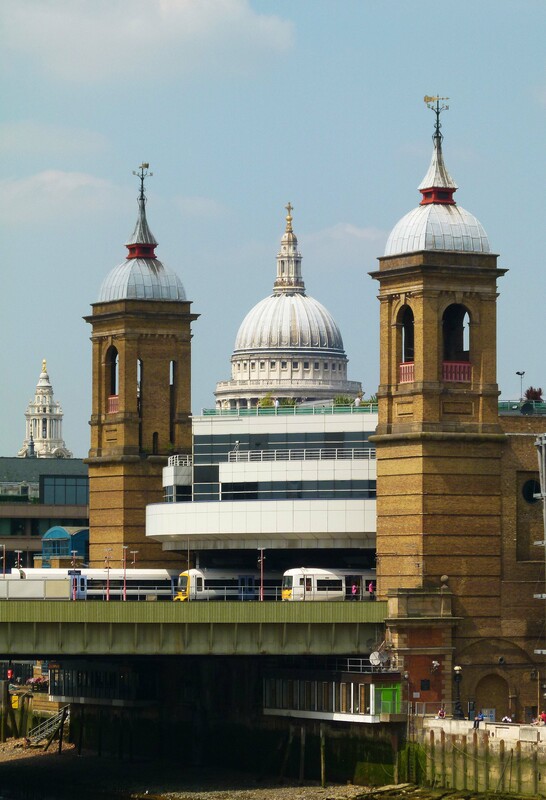 Built as the London terminal for the South Eastern Railway, Cannon Street station opened on the 1st September 1866. Designed by John Hawkshaw, the station’s first incarnation boasted towering walls and a soaring roof; 207 meters long and 32 metres high at its apex; “wider in a single span and longer than the roof of any other building in London” as a report from The Observer stated. 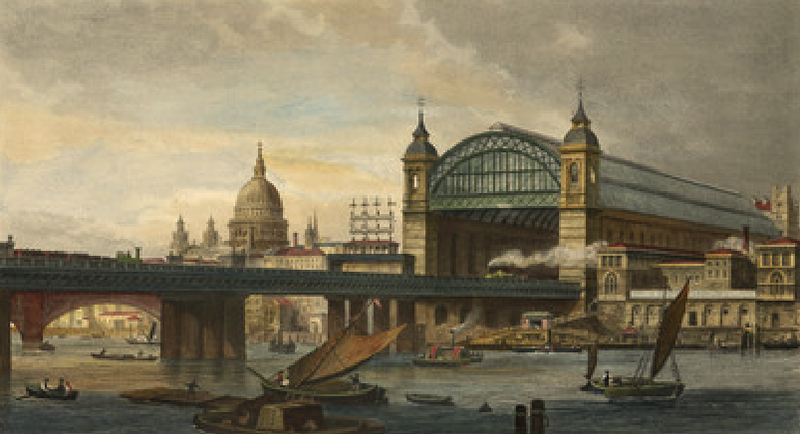 Cannon Street station in the 19th century. Must have been quite a headache to operate! 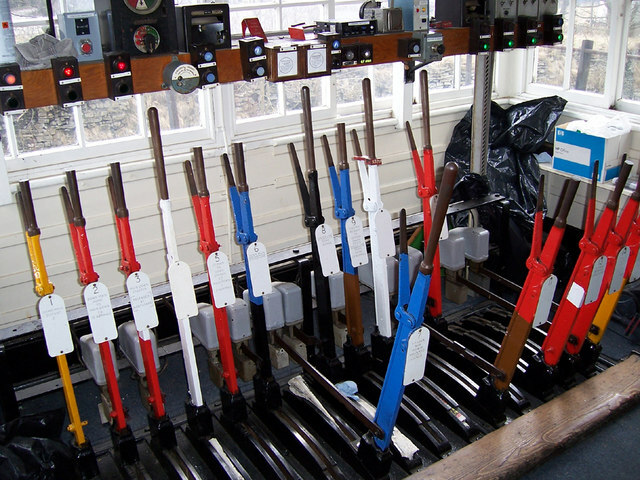 A selection of signal levers (Image: Geograph). All of this technology however couldn’t prevent an embarrassing mishap which took place in 1926. Shortly after leaving Cannon Street and crossing the Thames, a steam engine took a wrong turn on a viaduct. Led into a siding, high over Southwark’s Park Street, the driver slammed on the brakes… but it was to no avail; his metal steed smashed through the buffers and straight into the roof of Barclay and Perkins’s brewery! The 60 tonne engine ended up dangling 8 feet above the brewery’s vat room. Luckily, nobody was injured but the subsequent debris resulted in the tragic loss of over 200 barrels of beer! 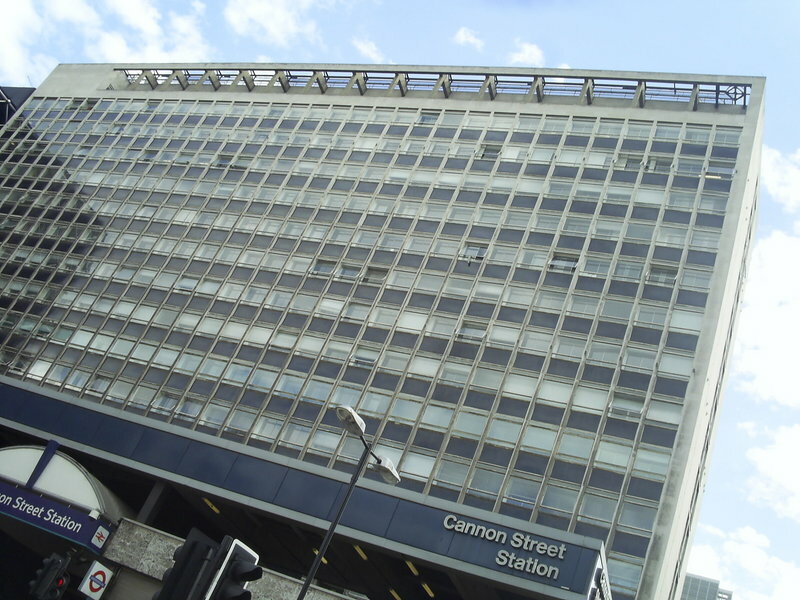 One year after the station opened the Cannon Street Hotel was added to the fledgling terminal. Designed by E.M Barry- son of Charles Barry, the main architect behind the Houses of Parliament- this new addition blessed the station with an extremely elegant façade. 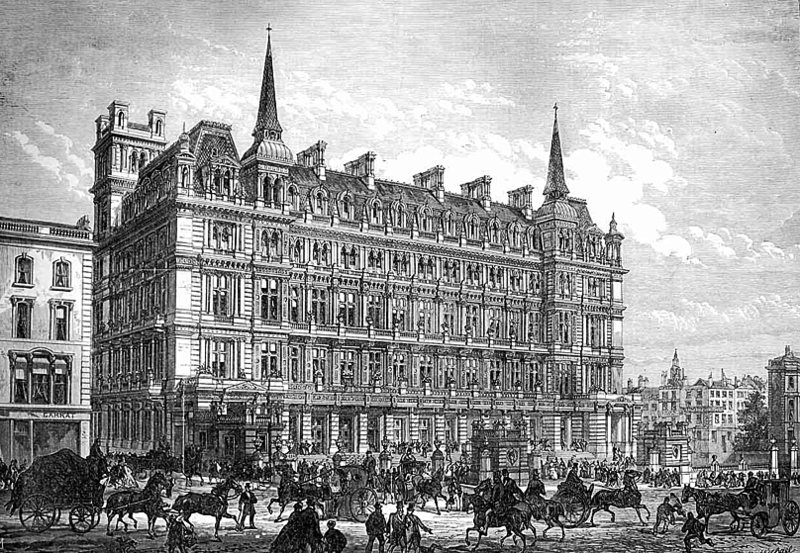 Cannon Street Hotel as pictured in the ‘Illustrated London News’. In its day, the Cannon Street Hotel was a popular venue for meetings and conferences; many of which proved to be turbulent and overheated. It was here, in July 1920, that the British Communist Party was founded, no doubt encouraged by the revolution in Russia which had taken place three years previously. 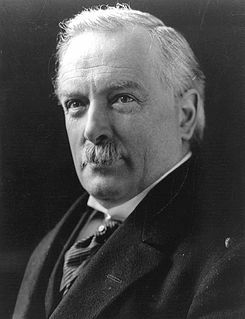 In 1927, whilst attending a dinner at the hotel, politician David Lloyd George had his expensive overcoat stolen from his room. 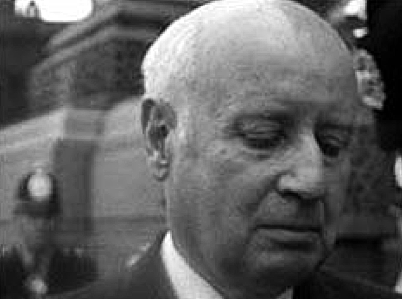 The thief was promptly collared in the main lobby but the former Prime Minister was so moved by the “pathetic story of distress related by the thief”, that he insisted the misguided fellow be set free. In the 1930s, the hotel bedrooms were converted into office suites. This new scheme did not last for very long however- the grand building was destroyed during the Blitz. This view of St Paul’s from the vicinity of Cannon Street demonstrates the devastation suffered in the area. 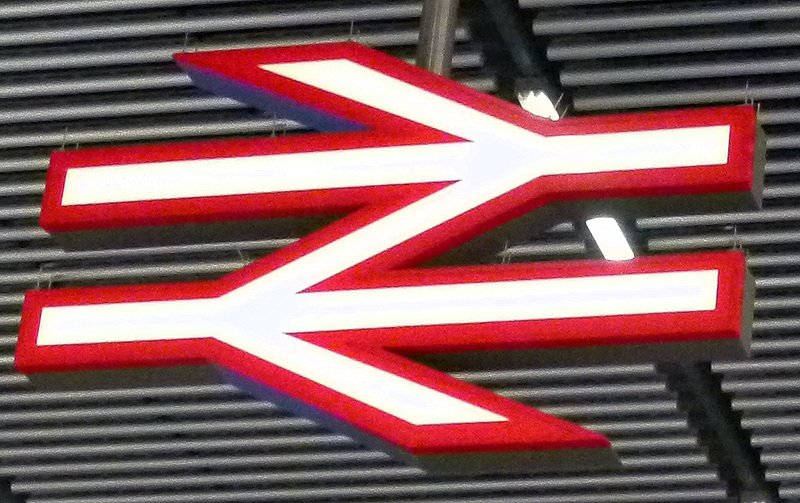 Another casualty of WWII was the station’s celebrated glass roof. When hostilities broke out in 1939, the wide expanse of panes had been carefully removed and taken to a factory for safekeeping… unfortunately, this supposedly safe haven was itself bombed, taking the stacks of glass with it. 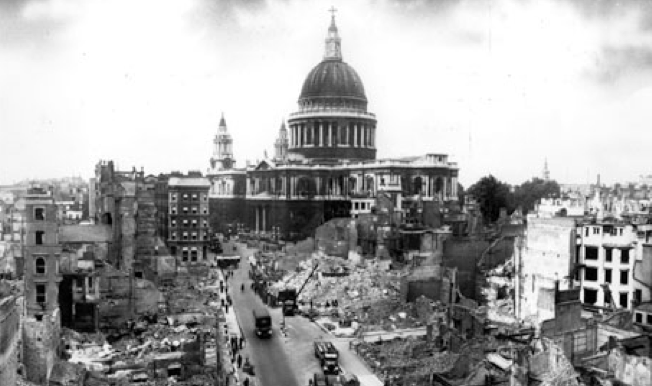 Scarred by bombs and with its roof lost, Cannon Street was in a sorry state following WWII. 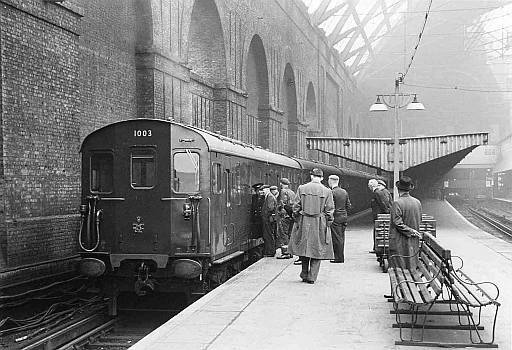 As the rare image below, taken in 1957, shows, the lack of glass meant the terminal was open to the elements, requiring shelters to be built on the platforms. The station remained neglected until the 1960s when the terminal was redeveloped in a style typically modern of the time. The main element of this scheme was a large office block, replacing the old frontage once occupied by the Cannon Street Hotel. The skeletal, glassless iron frame of the old roof was also dismantled. 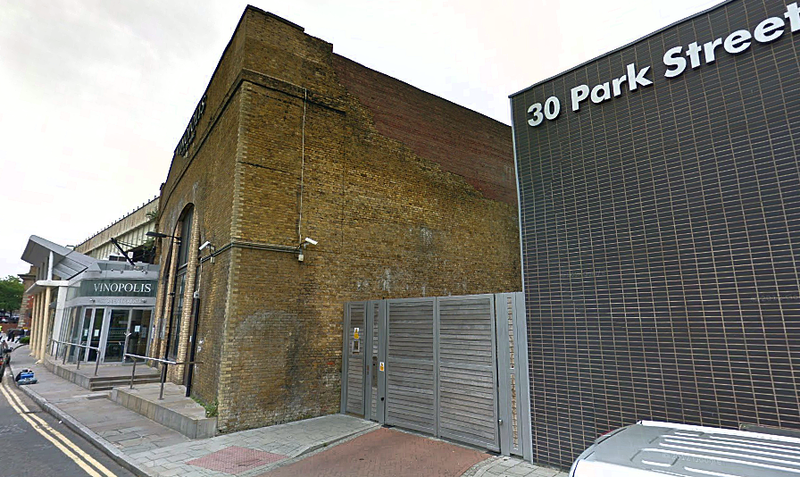 The new offices were designed by John Poulson… whom it was later discovered won the contract thanks to backhanders and a shady friendship with Graham Tunbridge; a surveyor for British Rail. Tried for corruption, the pair were found guilty- landing Poulson a seven year prison sentence. With financial markets booming, further office space was added in the 1980s and the station’s famous towers were treated to a full restoration. A bold scheme to add a helipad, first mooted in the early 1960s, was also revived. However, with the promise of up to 70 helicopters buzzing in and out of Cannon Street every day, grave concerns were raised as to the potential noise levels and their effect on offices and services at nearby St Paul’s Cathedral. Three towers… Cannon Street and nearby St Paul’s Cathedral. In 1990, the issue was raised in Parliament, with one MP suggesting that “the proposal is an utter disgrace… uncivilised and wrong.” Needless to say Cannon Street’s heliport never came to fruition. 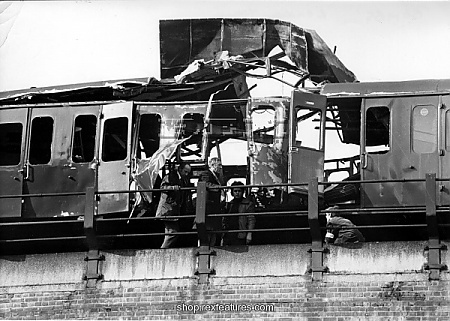 During the morning rush hour of 4th March 1976, regular passengers from Sevenoaks into Cannon Street had an extremely lucky escape when a 10lb IRA bomb exploded on a train. Miraculously, the train was empty; the device detonating as the carriages pulled out of Cannon Street shortly after unloading 100s of people. Eight people on a passing train suffered minor injuries. Had the bomb gone off just thirteen minutes earlier the results do not bear thinking about. The bombed carriage which was mercifully empty. 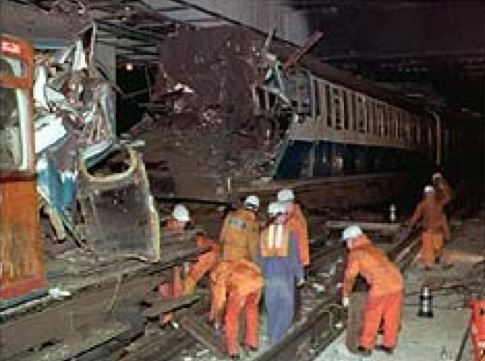 Another shocking rush hour incident occurred on the morning of the 8th January 1991 when a train rolling into Cannon Street failed to stop, crashing into the buffers. Although only travelling at 10mph, the impact had devastating results, turning the carriages into a crumpled mess. The shocking result of a 10mph shunt (image: BBC). Two passengers; 59 year old Patricia McCay and 24 year old Martin Strivens were killed and a further 542 were injured. With many people trapped in the tangled mess, rescue teams had to battle for 15 hours to cut people out. 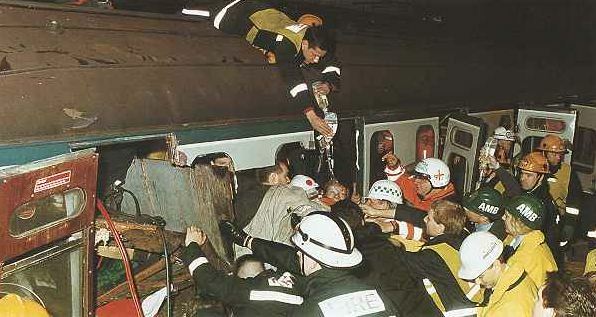 Rescue teams at Cannon Street, January 1991. (Image: The London Fire Journal). During the inquest, it was discovered that two of the coaches involved had under bodies dating back to 1928 and 1934. Although the main bodywork had been rebuilt over the years, the bases of these carriages had become perilously weak, forcing the main compartments forward like a pack of cards in the low-speed shunt. 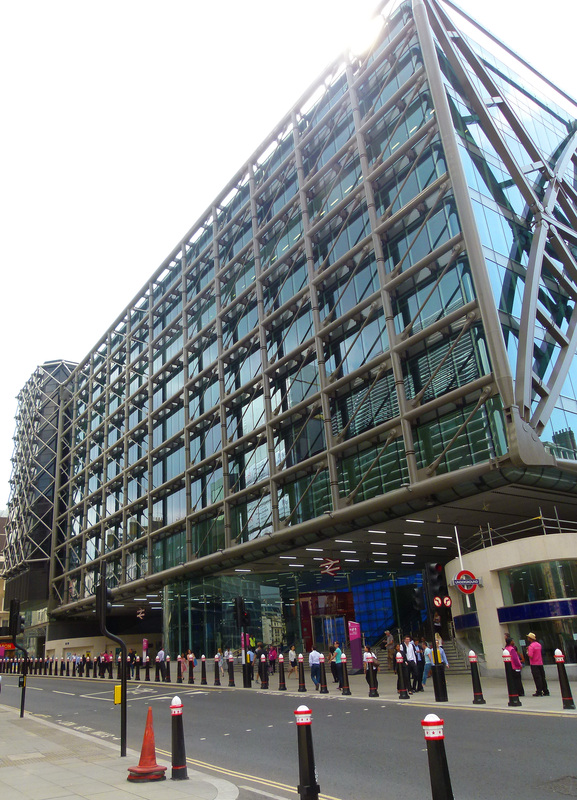 In recent years, Cannon Street has once again undergone dramatic change. Poulson’s 1960s block was swept away in 2007 as part of a £360 million project to revamp the terminal. Designed by US developer, Hines, Cannon Street’s latest look consists of 400,000 square ft. of gleaming office space accompanied by a further 17,000 ft. of retail space. The once celebrated space above the platforms has also found a new lease of life… having been transformed into a stunning rooftop garden! 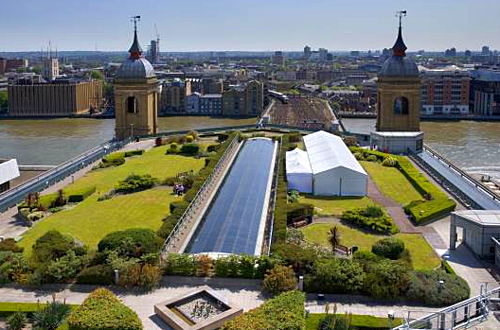 Cannon Street station’s rooftop garden (image: Tropolis).